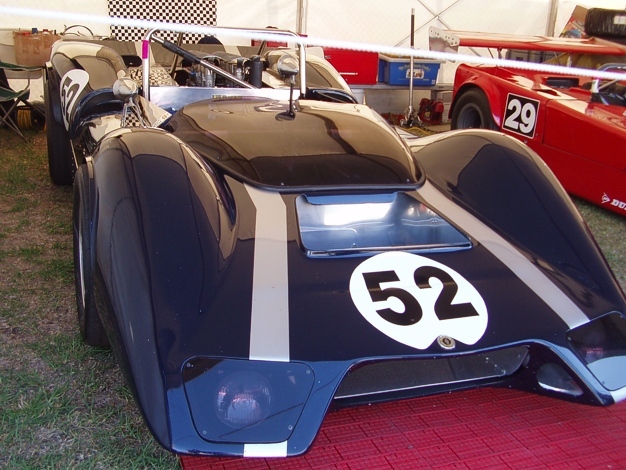 Built for Frank Matich by Elfin Sports Cars in 1966.This one of four cars built,chassis number BB662.Originally known as the Traco Olds.Frank won the Australian Sports car championship at Longford in 1966.Car sold to Neil Allen in 1967 who fitted the Chev engine.In 1969 car was sold to Fred Gibson and he rebodied the car and called it the R+T Chev.I have owned the car since 1987. Last edited by raltracer; 10-06-2008 at 08:23 PM. it's a pity the powers that be are keeping this off the track. Some of our members would know the background,but will briefly explain the reason. I bought the bones of the car in 1987 and it was in a different format to now.I built the car in it's present format and the CAMS issued an HISTORIC LOG BOOK in 1989 ,i raced the car till 1995. Around this time the Certificate of Description procedure was being introduced and all non COD cars were having there specifications revisited. The Victorian Eligibility officer brought to my attention the nose specification was not correct. This is where it becomes complicated,the car was built by Elfin Sports Cars for Frank Matich with the present nose,but was powered by an Oldsmobile,hence the Traco Old's name.In 1966 Bevan Gibson driving the sister car flipped at Bathurst and was killed.The thoughts were that the horns were generating aerodynamic lift,so Matich cut off the horns and so doing created a snub nose appearance.It did not fix the lift problem,slots were cut in the rear of the front guards to expell excess air pressure,instant fix. Frank sold the car to Neil Allen in 1967 who fitted a Chevrolet.So now it is in snub nose and Chev guise. Around 1995 the CAMS requested me to cut off the nose horns as it is not in it's 1967 format. As i prefer the present appearance and had been racing the car for six years and was satisfied that it was safe to race i decided to put her away rather than change anything. Now and then i am able to show her off at the odd Demo event for which i am grateful. So it has the 1966 nose and the 1967 engine and the COD was meant to be for 1967. If i want to compete with the body that appears in the pic above,i have to put the 1966 Oldsmobile engine in it.If i want to run the the Chev,i have to cut the nose off. Last edited by raltracer; 10-09-2009 at 10:33 PM. Now that is sorted, when is it coming out? I am not sure if the owner is still up to it! !